In the world of rum there are iconic drinks and then there are ICONIC drinks. While most people may not be familiar with the Palmetto or the Twelve Mile Limit, just about everyone the world over knows of the Mai Tai and the Mojito. Both drinks are standard-bearers for rum, but both also share a common ancestor – the most iconic rum drink of all, the Daiquiri. A simple rum sour, the Daiquiri is perhaps the single most important rum drink ever created, and one more abused than any other as well. Fresh lime juice, rum and just the right amount of sugar should mix together to form an incredibly refreshing drink. This is a cocktail that you want to sip when the weather is warm and you need something crisp. Unfortunately, there has been a tendency of mass-produced daiquiris to somewhat sully the reputation of what I consider to be the world’s most perfect drink. If you look above, you’ll notice that nowhere in the recipe does it call for Sweet & Sour mix or a special daiquiri machine to make the drink. In fact, the original daiquiri requires no blender of any sort. The daiquiri is said to have originated in Cuba at the end of the 19th Century, but its roots stretch back much further. Rum, sugar and lime was hardly a new idea by the time the daiquiri came into being. The most famously recorded early example of the rum sour comes from the British Navy in 1740 when Admiral Vernon started issuing sailors their rations of grog – a mixture of rum, sugar and lime. After the Spanish-American War, American servicemen and industrialists found themselves spending a lot of time in Cuba. Here is where legends start to mingle with mixilogical history. As Wayne Curtis points out in his masterful And a Bottle of Rum , there are several distinct stories detailing the creation of the daiquiri. Most credit an American by the name of Jennings Cox, who managed mines near the town of Daquiri, in Cuba. From these facts the story fragments into versions involving him creating the drink because he was out of gin (unlikely), he was hosting a collection of dignitaries including Facundo Bacardi, or that he did not invent the drink at all but simply gave the drink its name. Other possible histories involve another American, William Shafter. According to legend, Shafter took the preferred libation of the Cuban rebels (rum, sugar and lime) and added America’s greatest addition to mixology: ice. Whatever the actual origins of the drink, it was a hit. By the time the US found itself locked in the grips of Prohibition, Americans were flocking to Havana to sample daiquiris of all shapes and sizes. The drink grew and evolved as the more well-known bars and bartenders in Havana tried to find more and newer ways to tickle the American palate. Perhaps most famously – when it comes to daiquiris – was La Florida and its most famous bartender, Constantino Ribalaigua Vert (aka El Grande Constante). The Big Constante took the daiquiri to new and dizzying heights and drew praise from the glitterati of his age, as well as the faithful following and patronage of one Ernest Hemingway. 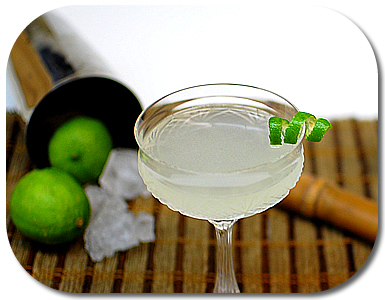 Constante created numerous variations of the daiquiri. 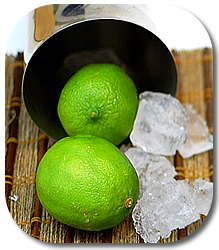 The number 1, or original daiquiri, was made with 2 ounces of Bacardi rum, 1 teaspoonful of sugar and the juice of one half of a lime (the famous La Florida Cocktail Guide says “lemon” but the Spanish side of the recipe says limon verde or green lemon – meaning lime). Other versions added Curacao (the #2), Maraschino (the #4 and eventually Floridita Daquiri) and finally grapefruit juice, Maraschino and a bigger helping of rum (the famous Hemingway Daiquiri). Anyone who has studied American Literature probably knows that Ernest Hemingway was quite fond of daiquiris during his time in Havana. If there was one thing that Hemingway was famous for other than his incredibly dry and sparse prose, it was his Herculean drinking – especially of my favorite drink. One thing that might not be as well-known though is that the manly man that was Papa Hemingway liked his daiquiris blended. But Dood, you just argued that blended daiquiris were wrong! You’ve said so many times! Somewhere along the way in Havana, people figured out that you could achieve the proper dilution and frigidity of a daiquiri by mixing it in a blender. This isn’t as much of a leap as you might think. The original recipe calls for the drink to be shaken with cracked ice. It’s a small step from that to crushed ice, and a daiquiri served over crushed ice is an incredibly tasty treat – a daiquiri frappe! When it comes to rums, the daiquiri continues to be one of the most versatile and interesting drinks ever. Purists will insist that you can only make a daiquiri with white rum (some will go so far as to argue only white Cuban rum or only Bacardi White). I find this to be an overly-rigid definition. 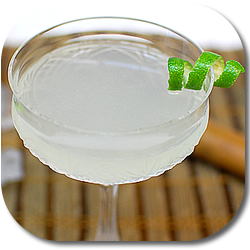 The daiquiri is a drink that lends itself to experimentation. One of my favorite drinks is what a lot of bartenders today are calling an Añejo Daiquiri – a daiquiri made with aged rum. The differences as you move from one rum to another allow you to tweak the proportions of sugar to rum to lime to get just the right balance and find a daiquiri that suits any weather and any mood. This may be one of the very few rum drinks which I encourage people to try with every rum they can get their hands on. It’s a drink tailor-made to be tailor-made. It is, to be bold, the world’s most perfect drink. What’s your favorite way to make your Daiquiri? At home, I make my Hemingway style (without the larger rum pour). When I’m out, a Daiquiri is a great way to determine if a bartender is trainable or not. Tell him or her you want a basic Daiquiri, not blended. If they know what to do, marry them (I heard that from someone once), otherwise, if they cheerfully do what you ask, you have one worth cultivating. The Hemingway Daiquiri and classic Daiquiri are two of my favorite cocktails. Though I’ll be honest, I really think of them as two very distinct drinks with some basic similarities. When it comes to a classic Daiquiri, I’ve lately been leaning heavily towards Havana Club anejo blanco. It really is just head and shoulders better than other white rums I’ve used, though my stash is going to be gone soon. I usually use TB White Sands and Neisson Rhum Agricole blanc as alternatives, though lately have been using Flor de Cana white and am liking it a lot. Also worth mentioning, Derek Brown recently made me a Daiquiri using Cruzan Black Strap Navy Rum at The Columbia Room. It was phenomenal and a great example of how well this cocktail lends itself towards experimentation. I’ll actually be covering all of the forms of the daiquiri, from the classic to the Floridita to the Hemingway to the Bacardi Cocktail. We’ll hit the Mojito and the Caipirinha and Ti Punch as well. An absolute favorite (but you all knew that..). I’m with Matt: it’s got to be Havana Club (I can only vouch for Cuban Havana Club). But I’d rather have work with Reserva or 3 Años. My problem is that I am a sucker for muddled limes. I know it’s not IBA spec, but I’ve never met a lime cocktail that I don’t prefer with muddled limes, rather than lime juice. Nice post, Matt — made me jump up and shake up a daiquiri! Usually I’ll use 10 Cane or Fleur De Caña 4 year, sometimes just Cruzan white and on days when I’m feeling fancy I’ll splurge and use the Oronoco. as far as daiquiris using darker rums, I think the Night Flight Cocktail from CocktailDB with rhum agricole vieux, lime, and maple syrup is exquisite. At the moment, I’m sipping a daiquiri made with a wild and funky Guadeloupe rhum agricole blanc called Rhum Bologne that recently came into my possession. The sugar and lime balance out this very assertive rhum quite nicely but still let the earthy funk shine through. Might have to bust out the cane syrup and step up to a ‘ti punch. Getting some of the oil out of the zest definitely adds a special something to a daiquiri. I’m a big fan of muddling as well, though you have to do a little extra straining if you don’t want a lot of pulp. Muddle lemon, lime and ginger with the simple syrup. Add all other ingredients, shake with ice and double strain. It’s a little bit more complicated than the ur-daiquiri, but all the basic elements are there and I happen to like the result a lot. The wood, sour, sugar and spiciness all play off of each other rather well. I had been making our Daiquiris and Mojitos with 10 Cane until last evening, when I did up a Daiquiri for my Bride with a different rum. One sip later, her nose squinched up and a great frown on her face, she declared that there was something very, very wrong with this drink, and she’d be having none of it. I guess I now have the definitive answer to your question: Daiquiris here are made with 10 Cane (and, oh yeah—a little less lime than you suggest). Thanks for the history, it was a lot of fun. ONO Crystal is a fantastic rum for daiquiris. I should have put that on my list. I think the only reason it didn’t occur to me is that it’s still not available here in California. That needs to be corrected. 10 cane, 10 cane, 10 cane… Is it just me, or is that stuff almost completely lacking flavor? It’s like the vodka of rums. I can see why someone would like it, but to me, it robs the the daiquiri of something deeply important: the taste of rum. funny but i tend to favor a “standard” daiquiri that’s a little on the sweeter side – a mix that’s 2 oz of rum + 3/4 oz each of simple syrup and lime juice – yet in a Hemingway, i like it a little more on the tart side. don’t know why. my first real light or silver rum was appleton white and i still like this in a daiquiri but prefer ED 3 or in a pinch i’ll grab my bottle of matusalem platino. @ Bill Connelly: That’s the fun thing about rum I think — a rum that hits so many right notes for one person can leave another person flat. Then just as often those same two people are in total agreement as to the wonders of another rum. I think 10 Cane is very good, and it’s one of very few white rums I would consider sippable as well as mixable. Good balance of flavor with no harsh white rum alcohol burn and more depth and maturity than most. Subtle, approachable for many who would shy away from more aggressive flavors, but still one I quite like. First, I love daiquiris. They are the pefect cocktail..I like to keep it simple with the sugar (or simple syrup) and the lime. Now on to the rum…this is where you can have some fun. I am a fan of the whites that have been mentioned. 10 cane and I have a on/off relationship…I truly love to take shots of this rum…I haven’t had great success mixing, but I recently used it in a Mai Tai (with Appleton 12) and it was awesome. We are an item again! I tend to enjoy my daiquiris with darker rums too…my two favorites are MG Sugar Cane and Bacardi 8. I am novice…how do get the lime to twist like that? Mistahunter: I use a channel knife to get the lime peel in a long strip. It isn’t always easy because lime peels don’t tend to come away from the flesh as easily as orange or lemon peels do, but if you have a good, sharp channel knife you can make it work. Once you’ve done that, just wind the peel around a barspoon in a spiral fashion, hold tight (but not tight enough to break) for about 30 seconds and you should be set. It won’t last forever – it does straighten back out on its own, and because the lime is a little more troublesome than a lemon or orange it can be a bit time consuming. If you want it to hold longer, prepare it ahead of time and leave it in the freeze or refrigerator. The cold will help it hold its shape longer. Dood, I got to thinking about it last night and it occured to me that in a Daiquiri the proper rum is most likely a Cuban, say Havana Club Anejo Blanco. But being in the U.S. using this rum is impossible so if I want a Cuban style I usually go with Matusalem Platino or say “to hell with the Cuban,” and stick with Old New Orleans Crystal. But I am very curious, having never tasted it, is Havana Club even that good? Not even just the white rums, but any of it? I assume its fantastic, but I also think that may just be because its forbidden. So my question is; is Cuban rum all that it’s cracked up to be? Does it make a superior daiquiri? Mojito? Or am I better off with Matusalem and ONO? My problem is, not being in the US, I can’t compare Cuban Havana Club to the Bacardi knockoff made in Puerto Rico. Havana Club is pretty good, however, it certainly isn’t the king of Cuban rum. Their anejo blanco is kinda rough, but they exponentially improve over the range of the brand. But it’s what I preferentially use in daiquiri (well, the anejo Reserva or 3 Anos). Ron Santiago is a (probably better) alternative. Great post! Can’t wait to hear some more about all the daiquiri variations up you sleeve. As the weather has turned here in Chicago (finally), I’ve been consistently shaking up daiquiris and mai tais. And I’m a recent convert to the Floridita. I’ve had wonderful luck with Appleton White. Out of curiosity, though, I picked up a bottle of the Mount Gay Silver Eclipse tonight and whipped up a Floridita. Wow was it terrible. Am I crazy? I’m pretty new to the rum scene and I’m wondering what to do with this barbados rum, because I sure won’t be making daiquiris with it. Any suggestions about where this rum will shine? Mount Gay Silver is not a rum you’ll ever make shine, Rafe. Best bet is to bury it in some 10-ingredient tiki punch or grog that’s three rums deep where you don’t have to depend on the light rum to carry the drink. I tried the daiquiri last night with 10 Cane….two thumbs up! It was very good. I’m a fan of MG Silver…for me, it works in a shot and in daiquiris/mojitos. Shake (optional) and serve over ice in an old-fashioned glass. Depending on the quality of the limes, I sometimes have to add the juice of a whole lime. The Angostura brings enough sweetness to the table that you need very little syrup or sugar to balance things. Muddle the strawberries well in the shaker. Add remaining ingredients and stir to extract a little more strawberry juice. Shake with ice and fine-strain into a cocktail glass. The pectin from the strawberries makes it smooth as silk, and the lime and strawberry juice + simple syrup balance exactly to create a drink neither too sweet nor too tart. I think I’ll be alternating these with Mai Tais as long as the supply of strawberries lasts. I’m a big fan of mixing and matching rums in my daiquiris and playing with proportions accordingly. My latest venture was a daiquiri with Old Monk. It won’t be an everyday cocktail, but the buttery smoothness was pretty appealing. Ummm… I love daiquiris. The other day I tried the strawberry daiquiri with this recipe and… it’s delicious!! Stir sugar with lemon filets until melted and pour it over the ice and rum, add a lemonseizt. Since I can’t trackback I’m commenting with a link to my Federal Glass Shaker Daiquiri recipe. Shaken and strained. A trick I discovered by accident was to rinse the glass out and put in in the freezer wet – the little bit of water not only chills the glass faster but it melts into the drink giving it just a touch of extra dilution. Overall the drink was delicious although just a bit sweeter and not quite as acidic as I would like – once I get the ability to properly measure I will work on getting the right balance. The main point though, is the small bit of dark rum – it really adds a unique dimension to it. Shake with ice cubes and strain into a chilled 6 oz cocktail glass. To get the correct taste on the lime juice I use a Mexican citrus juicer; I cut off the tip of each side of the lime so that the juice can flow freely and then I turn the lime half on its side and squeeze it a second time so that I can get the remaining juice and the oils from the peel. Previous post: May Mai Tai Madness: Win A Mai Tai Party!